Transnet National Ports Authority’s (TNPA) Port of Port Elizabeth recently signed its first long-term leisure and recreational tenant lease in the Baakens River Precinct, marking a milestone in plans to develop a future waterfront precinct at the harbour. The 15 (fifteen) year lease agreement with black economic empowered entity Lebolog (Pty) Ltd has led to the establishment of the new Shisa African Restaurant, which is located in the vicinity of the Baakens Street, considered one of the finest pieces of Real Estate in the port. The venue was officially unveiled on Friday, 2 September 2016 although trading began on Women’s Day in August. Port Elizabeth Port Manager, Rajesh Dana, said: “The signing of this lease takes the port further along on its journey of evolving into a ‘Smart People’s Port’ with improved community access and recreational activities. “We look forward to attracting a variety of tenants into this precinct in order to promote recreation, tourism and leisure activities in the Port. In the future the port’s Marina Development project – stretching from the Baakens River to Dom Pedro Jetty – will provide opportunities for expansion and growth for businesses,” he added. Lebolog (Pty) Ltd – owned by husband and wife team, Sibusiso and Zoliswa Nkosi – has owned and managed successful shisa nyama restaurants and events in Cape Town over the last few years. Having identified this niche market, they were inspired to create a similarly unforgettable experience in Nelson Mandela Bay by establishing Shisa African Restaurant. Co-founder Zoliswa Majodina Nkosi said: “Our primary aim is to simultaneously uplift the image of Nelson Mandela Bay and the Port of Port Elizabeth by contributing to and being a part of the much anticipated Port Elizabeth Waterfront. We also aim to create a leisure and relaxation venue away from home by combining African cuisine with the traditional South African shisa nyama experience, accompanied by entertainment from local Marimba and live jazz bands. Patrons can expect a unique and enjoyable atmosphere suitable for anybody from fun-loving families, professionals, tourists and students, across all colours and creeds”. “We have created 24 job opportunities for the Nelson Mandela Bay community and also contributed to the Eastern Cape arts and culture community by soliciting the melodies of local Marimba and Jazz bands,” she said. Those popping in at Shisa African Restaurant can expect a family-friendly menu comprising traditional dishes like umleqwa (fresh farm chicken), ulusu (tripe), idombolo (steamed bread) and umngqusho (samp and beans), alongside sophisticated seafood dishes and kiddies’ meals. Dana said the future marina development is envisaged as an integral part of the harbour’s development and would link up with the Mandela Bay Development Agency’s plans to develop the city’s Baakens River for leisure and recreational purposes. These plans are also anchored by Transnet’s concept of a “people centric port”, which aims to accommodate the diverse people of the Nelson Mandela Bay Metro both culturally and economically. 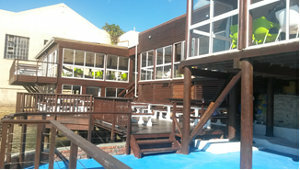 Editor: The Shisa African Restaurant is situated in what used to be the Oystercatcher Restaurant who moved out when the rentals became prohibitive and the security at all entrances much tighter which, understandably, had a negative effect on the number of patrons willing to enter the Port of Port Elizabeth. As regular visitors to the Port of Port Elizabeth we have observed that the security has relaxed significantly at the Baakens River Entrance with a new security gate now manned with four security officers just over the Baakens Bridge in between the Shisa African Restaurant and the Navy Building. Those with longer memories will remember the Oystercatcher was preceded by Dockside Debbies – a dubious establishment with great prawns, very aged steaks and some real pirates – led by their Captain and owner of the restaurant.